Hard to explain, but just two months after building my SURLY 1x1 s/s, I've decided to kick it up a notch. 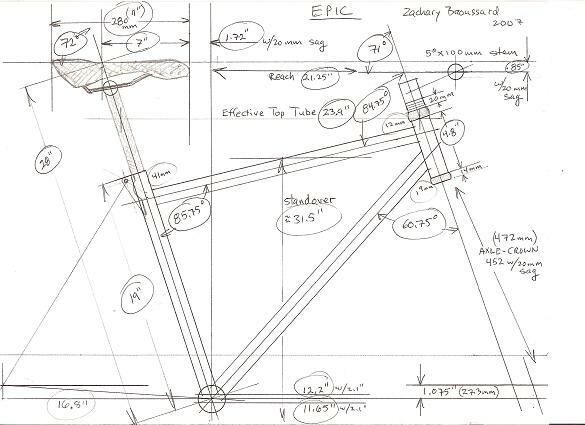 I'm currently working with Doug Curtis of CURTLO to spec a new custom built "just for me" frame. I'd appreciate input/feedback from any current CURTLO owners; this is my very first custom built bike. The Surly's only got 4-5 rides on her; oh well! Why is this cycling thing so darned addictive? nice choice. Doug built my first-ever custom frame as well. I had been testing the waters with a converted gearie hardtail, then sold my full-sus bike so I could get Doug a deposit asap. The bike rides like a dream and I also got a Curtlo rigid fork to go with it. Doug will take his time. worth the wait and MORE than worth the price. that you'll get your bike when you get your bike. an update every night.... I want a Curtlo and I'm willing to wait for it ! Look for photos in a couple of two three weeks. I'm stoked - getting an Epic Mountaineer w/ EBB. What are you getting? Yeah, it's strange. But oh well. I like your style, Holmes. you are sorely mistaken. I don't have to be nice to personal friends. But on the other hand, I don't expect much from them either. Wow, someone that still uses a table with a t-square and old school drafting tools! Almost two decades of custom frame building under his belt and still no CAD. I like it. I'm sure it's worth the wait! I appreciate you all letting me know that the build on this frame will take a while. No worries; I've still got my Turner f/s and my Surly 1x1 s/s to ride while I wait. I'll be anxiously awaiting those pics you mentioned. Isn't that kind of what you have to have with any custom builder? When Wade built my Vulture, I think it took 15 weeks. It was worth it. Doug told me it'd be about 10 weeks for my Curtlo. I figure I should factor in another 2 to 3 on top of that. I had Doug build me up my only geared bike, a cyclocross bike that doubles as my road bike, bright yellow, 9sp ulegra cranks, 9sp dura ace levers, 105 derailers, alpha q cross fork, but his rigid forks are awesome looking weighs about 21 lbs or less w/ cross tires and cheap wheels, it's sub 20 maybe even 19.5 or less with my king and open pro wheelset with road tires on it, rides awesome races quick, looks sweet, and I don't miss the trek 2100 carbon and aluminum road bike that it took the place of. My build was over time by maybe even a month, more then 2 weeks, but I guess that isn't too uncommon for many custom builders. I live in western Wa and met Doug at the Seattle bikeswap/bike expo where he usually has a booth at the expo. I talked with him in person some, saw some of his frames on display, and a complete road bike or two, then made the call thought about color and geometry, similar the my cross check SS crosser, but a little quicker steering, for a little more roadbike racer feel. Changed ht angle 1/2 degree comprared to the crosscheck, so it has 72.5degree head and st angles, I probably should have dropped the BB height just a little bit, for a little added sability but it works great as a road bike and awesome on the cross race course. I have raced with an older fellow who also has a bright yellow curtlo cross bike just like mine, but straight seatstays, and the matching steel fork, he won it in a raffle in Dougs home town in Winthrop Wa- eastern WA, -there is also a thread on rbr from another raffle winner who got a sweet orange road frame for $20 in tickets. My only minor compliant is that the paint has shown some wear, but it rides really nice and still gets plenty of looks, on the road and the cross course. IT will be worth the "MANDTORY WAITING PERIOD" And I have heard much worse stories of late coming custom frames then my experience. At least you got your order in b4 the seattle bike swap and expo, which is this weekend, maybe I'll say hi to him again if I see him there. I suspect that he probably gets quite a glut of orders from the bike expo, almost spring weather maybe still kinda rainy but days getting longer, many bike riders starting to get ready for road or mt bike racing or just more ridding in general and coming out of partial hibernation, and hopefully the groundhog was correct w/ the shorter winter weather. 10 to 15 weeks is nothing. A.N.T. is at 10 months, and on the road side Richard Sachs is at 43 months!